Are you experiencing behaviour issues with your canine companion? Fear, aggression? Maybe your pup is a new rescue here in Canada for the first time and having difficulties adjusting? Well help has arrived in Bloor West Village! We are so excited to announce, Dr. Dawn Crandell DVM, DVSc, DACVECC, CTC! 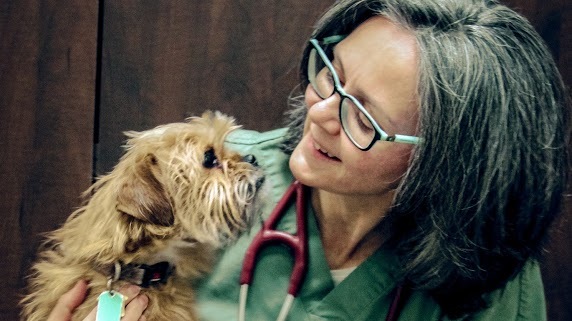 Dr. Crandell is a critical care specialist who has been helping pets in the ICU for many years. She has been there in their time of need and helped counsel their families through their most difficult times. After adopting a young small dog with a multitude of behaviour issues, she realized she had a lot to learn about training and behaviour problems. Working with trainers and doing her own research to help her own dog, she discovered a passion for canine behaviour. After studying with Jean Donaldson, one of the best in the field of canine behaviour and owner counseling and graduating from her 2 year course in the Academy for Dog Trainers, she immersed herself in the veterinary behaviour community and studied the behaviour literature, texts and journals. Armed with a wealth of veterinary experience to understand the interplay of medicine and behaviour, a solid understanding of normal and abnormal canine behaviour, proven and safe behaviour modification techniques, along with familiarity with the common pharmaceuticals used in select cases, Dr. Crandell is available to help people with their dog’s behaviour problems. If you have a dog who is experiencing behaviour issues and would like Dr. Crandell’s guidance, please contact us today. We can facilitate a consult with Dr. Crandell right here in our clinic!